If you are a Burke regular you’ve likely run out of appendages counting how many times you’ve heard these expressions when talking to someone about Burke. Burke is closer time or mileage wise to both Hartford and Boston than Stowe, Smuggler’s Notch, Sugarbush, Jay Peak, and Sunday River. It is all Interstate highway except for the last 7 miles. Burke is not small and it is not big. It has a full 2000+ foot vertical drop and 270 acres. That 270 acre figure does not include a vast array of off the map glades. The total area within the boundary ropes is over 500 acres. Burke has a layout that is very family friendly. The “Lower Mountain” is served by the Sherburne Express HSQ and offers 580 vertical feet consisting of 5 beginner trails and 2 glades. Burke’s main terrain park, Dashney Mile, and the main base lodge are also located here. Two surface lifts, a short carpet and a J-Bar, service the beginner area right near the base lodge. This entire pod is great for beginners since it has a fairly low pitch which results in the higher speed expert skiers/riders generally avoiding it, allowing for a relaxing place to learn. The Enchanted Forest glade is a great place to get comfortable skiing through trees, which is an excellent ability to have for any skiers/riders working toward advancing to the upper mountain. The “Upper Mountain” starts at the Mid Burke Lodge and is accessed from the recently installed (and long overdue) Mid Burke Express HSQ. The Mid-Burke Express (MBE) gets you to the summit in about 8 minutes. An older fixed grip quad also serves the summit and is used as a back-up lift or can be brought online if things get too “crowded”. The historic high speed Poma surface lift serves the central part of the upper mountain. This lift is primarily used by Burke Mountain Academy and other racing organizations that use Warren’s Way trail (aka “The Training Hill”) for Slalom and Giant Slalom race courses. You can get a great view of potential future Olympians smashing through the gates from the MBE. There are no beginner trails on the upper mountain. All trails are intermediate and advanced. Deer Run (aka Toll Road) is the easiest way down and it can be skied by beginners. However, it is classified intermediate due to many trail intersections and its narrow width. Popular groomed intermediate trails on the upper mountain include Upper/Lower Willoughby, and Upper/Lower Dipper. Upper/Lower Dipper is sometimes used for Super G racing due to its interesting undulating character and its 1450’ vertical drop. Many of Burke’s upper mountain trails pull off a rare and special balance of having those interesting undulations while maintaining a relatively consistent pitch to the bottom (i.e. no major flat spots, and limited runouts at the bottom getting back to the lift). This balance of character makes Burke a lot of fun to ski. You can’t see the bottom of the trail from the top. One of Burke’s more famous trails is East Bowl. This trail requires a traverse around to the remote eastern edge of the resort’s boundary. Typically ungroomed, this trail is the pinnacle of the undulating character described above. Skiing this trail at speed is often likened to a rollercoaster. However, it does break the long flat run out rule due it going so far around the side of the mountain.The upper mountain is also home to the majority (13) of Burke’s glades. Burke’s glades are a lot of fun. The eastside glades (Sasquatch, Throbulator, and Caveman) typically fill in first. Westside glades (Birches and Jungle) fill in last and everything in between is well… in between. Each glade has a unique character but maintain that fun undulating quality. There are also many unmarked stashes in the trees. So don’t be afraid to talk to people riding the lift with you, they may take you somewhere really fun. 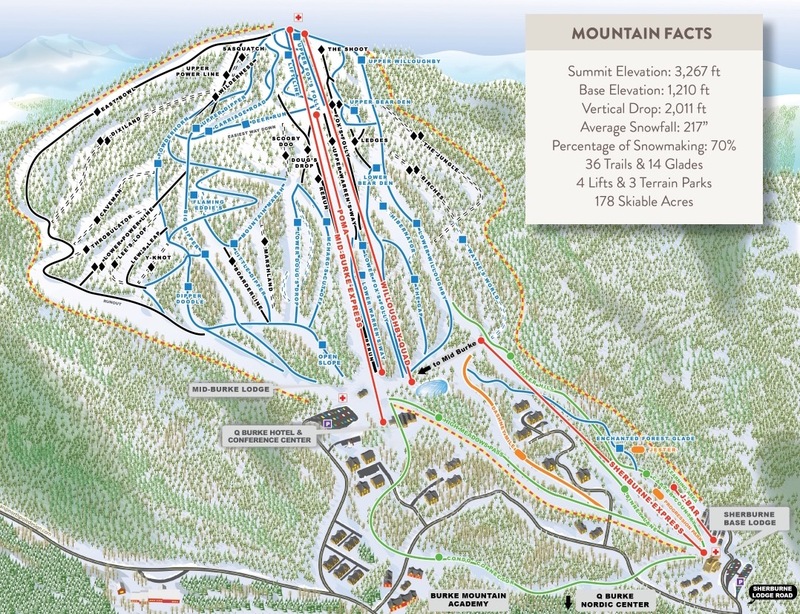 In the Spring of 2012, part of the Jay Peak ownership purchased Burke Mountain. The Quiros family has plans to upgrade a lot of Burke’s infrastructure and add a lot of bed base near the Mid Burke area. Q-Burke as the mountain is officially named now is going to change a lot over the next several years. So if you want to try it out before the transition, get there for the 2013-14 season.